i have been making my vegan chocolate cake for years and first shared it with you in 2009. i call it my "just happens to be vegan" cake because i realized it was vegan after the fact. the goal was to make a cake that was delicious and healthy...so extra virgin olive oil was used instead of butter, balsamic vinegar substituted for eggs and fresh figs or shredded zucchini provided additional moistness. this has become my "go to" cake...fast, easy (no mixer , a bundt pan versus layers) and relatively good for you. recently i have been challenging myself to amp up the "healthy" component, while still keeping the "deliciousness" factor strong. otherwise, why bother? using whole grains and eliminating white or brown sugar has been the goal. sneaking in fruit or vegetables is an added bonus. 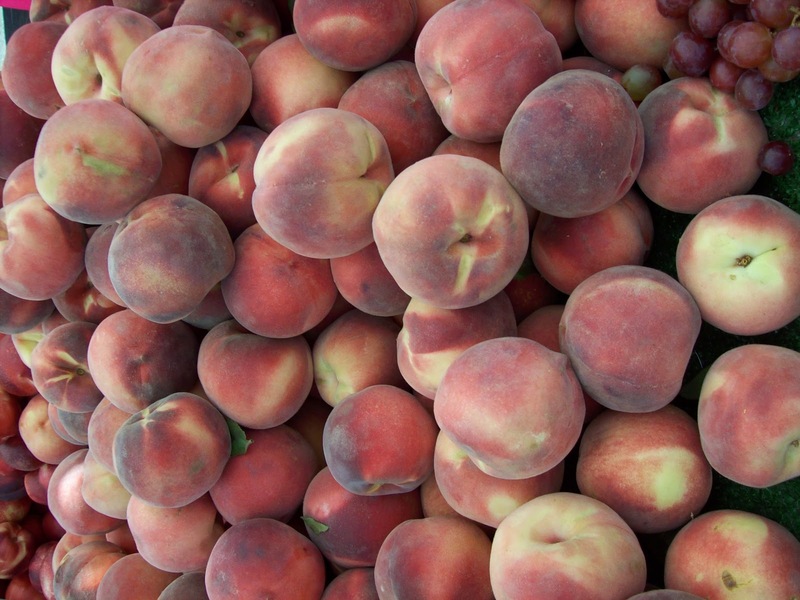 this is "peach" week at food network's summerfest. i decided to rework my beloved vegan recipe by making a vanilla cake and replacing the figs with peaches and coconut. the chocolate version uses unbleached white flour and white cane sugar. my revised one uses two whole grains that i love ...spelt flour and teff flour. spelt flour predates wheat flour by 9000 years! it is stone ground and very water soluble which helps ensure its vital nutrients are quickly absorbed by the body* (*info from bob's red mill). while spelt flour is NOT gluten free and therefore not an option for those suffering from celiac disease, it is often a good option for individuals with gluten sensitivity. according to bob's red mill, "teff flour is made from the smallest grain in the world. compared to other grains, it has a much larger percentage of bran and germ so it is a very good source of dietary fiber, protein and iron" and it is gluten free. both are available in specialty shops like whole foods and the health food section of large grocery stores. i find that combining these two grains provides a bit of a nutty flavor with a lightness not found with whole wheat flour. preheat oven to 350 degrees. grease (use olive oil) a bundt pan and set aside. sift flours, salt and baking soda together into large mixing bowl. bowl. add the remaining ingredients one at a time stirring after each addition until just combined. you can use a mixer but i just use a wooden spoon and do this by hand. do not over-mix. pour batter into prepared bundt pan and bake 60 minutes or until a cake tester inserted into center of cake comes out clean. (begin checking after 45 minutes...do not over bake) remove from oven and allow to cool on rack until just slightly warm. remove from pan and allow to cool completely before cutting and serving. ** i like this as is, but you could frost with your favorite cream cheese frosting if desired. I love all the whole grain goodness in this cake - definitely could eat a slice for breakfast. Loving all these peach recipes! special offer for our friends!